I’m honored to be a Stonyfield Ambassador this year, sharing deliciousness including this Banana Split Parfait that is the perfect picnic treat! When springtime rolls around, I get my picnic gear ready. I pack the blanket, a ball, the pimento cheese, the banana split parfaits, and water. Then I round up the dog, baby and husband. Phew! The preparation for a picnic is always worth it for the countless hours of memories you make with your family. On a picnic just this past March, Liam first learned how to kick a soccer ball. My father, an avid soccer (fútbol) fan and player himself, was so proud! Now, your banana split parfaits won’t be as overflowing as this one, because it will most likely be in a jar or some kind of re-useable container. But, the flavor is all there. And let me tell you, this is the kind of banana split you’ll want to take with you. 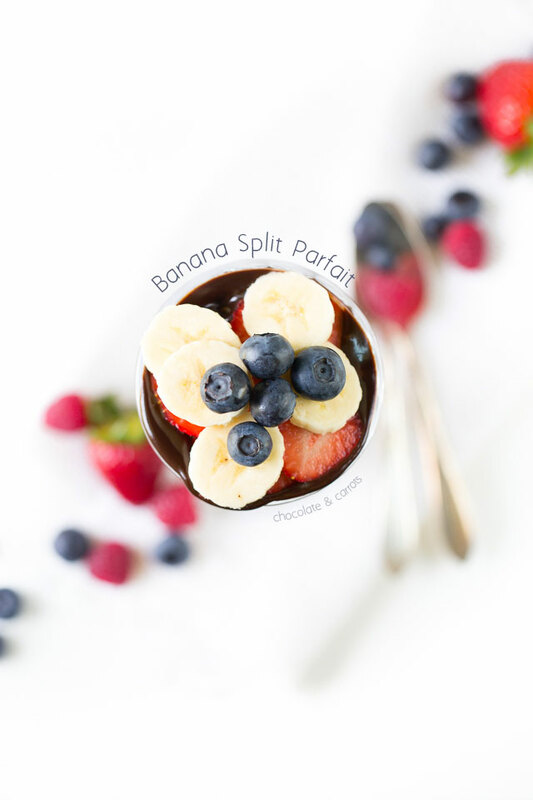 Not only is there no ice cream to become a melty mess, but these are SO much healthier than your traditional banana splits, without sacrificing the flavor. You can really have fun with these and add your favorite healthy toppings, like fruit and nuts, then, surround it with your favorite yogurt! I love to use Stonyfield’s non-fat plain greek yogurt, but I actually chose their low-fat plain yogurt for this photo. It layers so nicely in a parfait. Don’t you think? 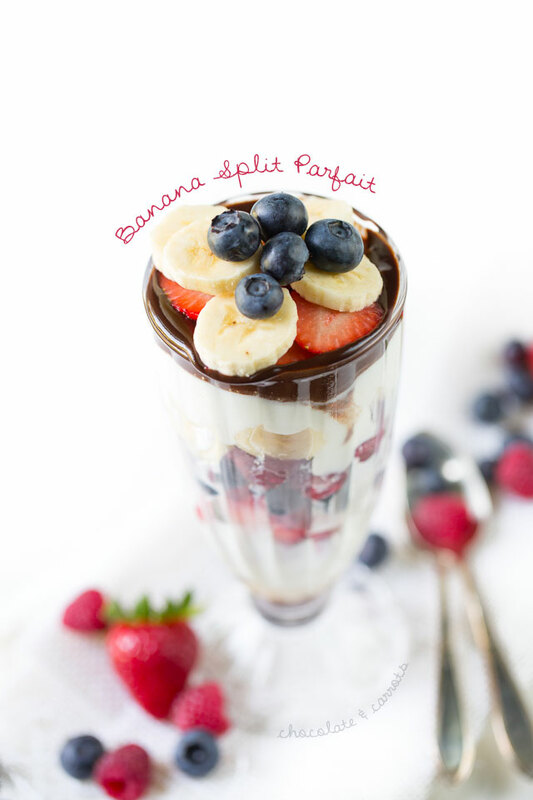 What is your favorite banana split topping? Layer the ingredients in whatever order you’d like. If you’re packing for a picnic, layer in jars and pack in your cooler! This post was sponsored by Stonyfield Organic. 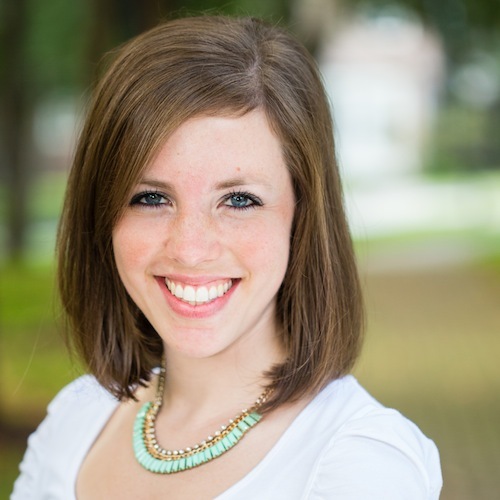 I am a Stonyfield blogger captain/brand ambassador because I truly believe in their products. I received compensation for this post and posts to follow. All opinions are my own. Please read my disclosure policy for further information. Chocolate & Carrots Guest Post on Hungry Meets Healthy! Hey! Looks AMAZING – seriously, I’m drooling. I LOVE hot fudge. I never thought of making such a hybrid desert. Hannah would love it, she’s going through a serious yogurt phase (and, on top of that, bananas are one of the few fruits she’ll eat whole. . . oh, and she loves chocolate). Thanks for the recipe! 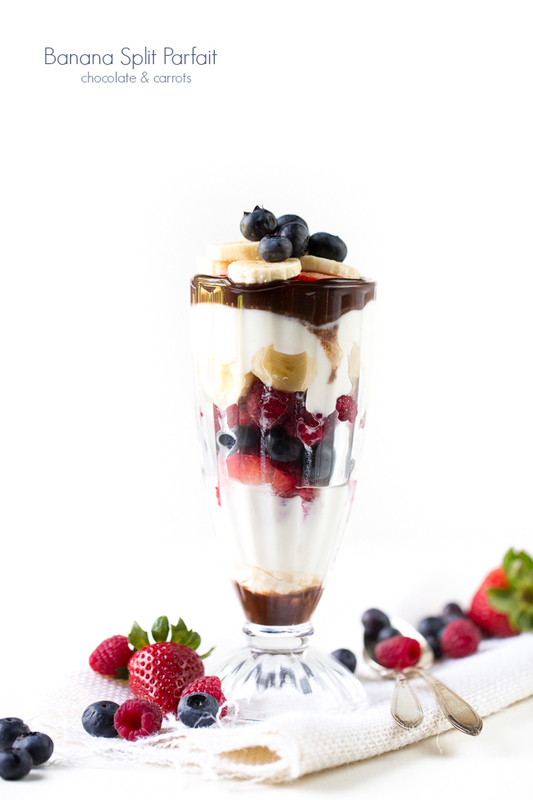 Love Stonyfield, love parfaits, love berries and love all that gooey chocolate fudge! What is there not to love about this delicious parfait?! These look great! I wish I had one right now! These pictures are incredible, Caroline. Beautiful shots. Beautiful recipe!